Capitalism is very efficient, somewhere. 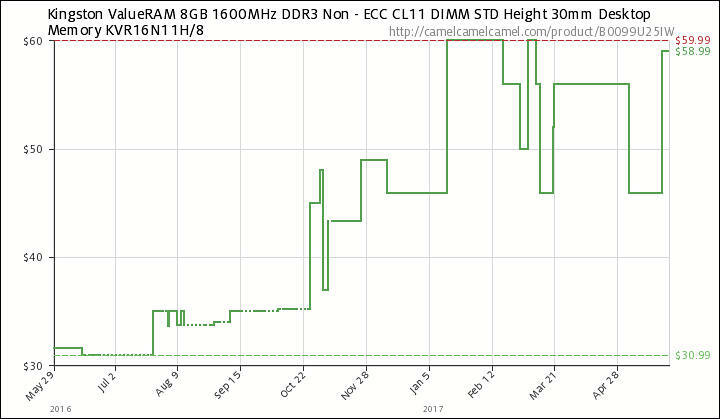 DRAM prices (same as NAND) is kind of mad, due to production/consumption issues and cartel agreements that followed. The global DRAM market will remain an oligopoly of three large firms over the next three years, according to Pei-Ing Lee, president for Taiwan-based Nanya Technology. Lee believes that China's emerging DRAM companies will not be able to pose a threat to their bigger counterparts within the next three years. The competitiveness of China-based DRAM players will really depend on IP and innovation, which brings uncertainty to their future, Lee said. Lee also expressed optimism about the DRAM market outlook for the second half of 2017. Demand will still outpace supply during the six-month period, according to Lee. This is how society parasites live. Samsung Electronics and SK Hynix saw their mobile DRAM revenues decrease 6.3% and 2.8%, respectively, on quarter in the first quarter of 2017. Despite the revenue drops, their combined share of the global mobile DRAM market remained above 80% during the quarter, DRAMeXchange said. Also show that at desktop market we see cartel agreement (btw same existed for CD and DVD drives, monitors, now work in HDDs sector). TrendForce reports that the average contract price of server DRAM modules rose sequentially by nearly 40% and 10% respectively for the first and second quarter of 2017 due to tight supply. In the third quarter, the average contract price of 32GB server DRAM modules for first-tier customers is projected to arrive around US$260, while the average contract price of 32GB modules for second-tier customers may be higher than that threshold. 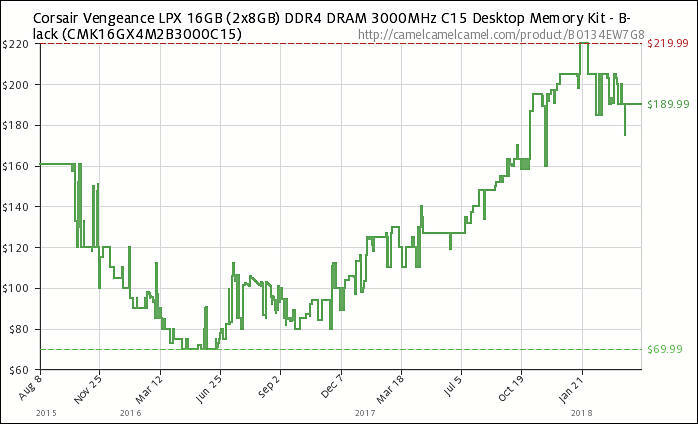 The latest forecast by DRAMeXchange indicates that the average sequential price increase for server DRAM modules in the contract market for the third quarter will be in the range between 3% and 8%. Average contract prices for PC DRAM modules rose nearly 40% sequentially to US$24 in the first quarter of 2017, and grew another 10% to US$27 in the second quarter, said DRAMeXchange. Prices for July alone increased 4.6% on month. August quotes for RAMs used in VGA graphics cards have risen to US$8.50, up by 30.8% from US$6.50 in July. Both RAM industry leaders Samsung Electronics and SK Hynix have allocated part of their VGA RAM production capacities to producing memories for servers and handsets, fueling the price rally. Following the shift of part of its RAM capacity from the graphics card segment to the server segment, currently the server RAM accounts for 27% of Samsung's overall RAM capacity, up significantly from 12% originally. 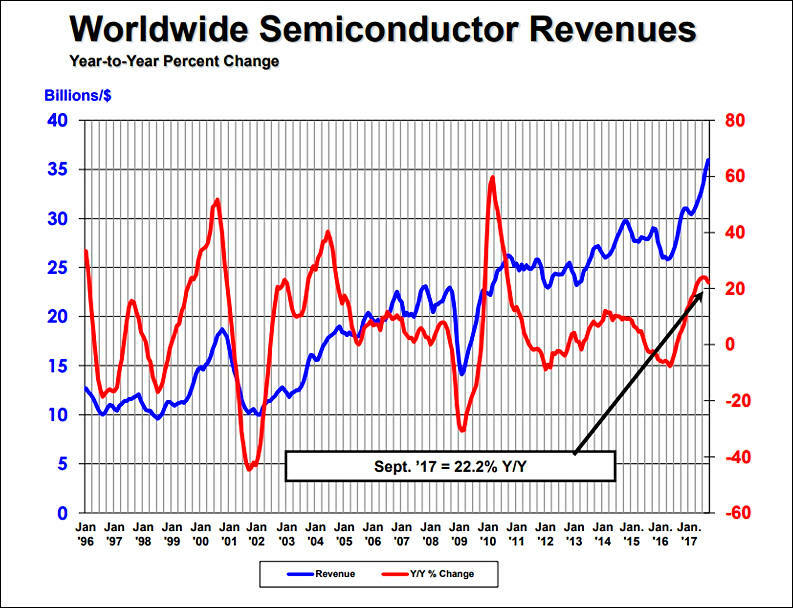 Samsung Electronics, SK Hynix and Micron Technology generated a combined US$4.43 billion in server DRAM revenues in the second quarter of 2017, up 30.1% from the about US$3.4 billion the top-3 suppliers collectively posted in the prior quarter. Global DRAM module sales totaled around US$6.9 billion in 2016, down about 12% from US$7.9 billion a year earlier, according to DRAMeXchange. Falling PC DRAM prices during the first half of the year and the continuing contraction of the DIY market were the main factors behind the revenue decrease. Kingston Technology continued to dominate the DRAM module market in 2016 with a 72.55% share, DRAMeXchange indicated. 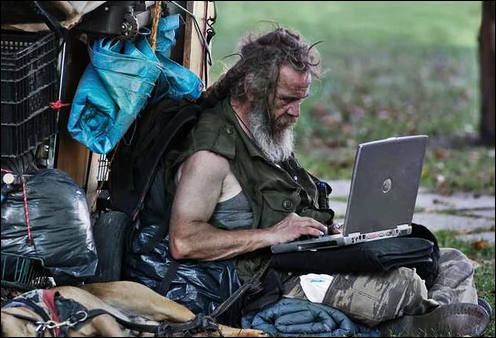 But this guys compensated it all. The three remaining major DRAM suppliers—Samsung, SK Hynix, and Micron—are each currently enjoying record profits from their memory sales. For example, Micron reported net income of $1.65 billion on $5.57 billion in sales—a 30% profit margin—in its fiscal 3Q17 (ending in May 2017). In contrast, the company lost $170 million in its fiscal 4Q16 (ending August 2016). A similar turnaround has occurred at SK Hynix. In 2Q17, SK Hynix had a net profit of $2.19 billion on sales of $5.94 billion—a 37% profit margin. In contrast, SK Hynix had a net profit of only $246 million on $3.39 billion in sales one year ago in 2Q16. DRAM memory will remain tight during most of 2018, as major suppliers have no plans to undertake large-scale capacity expansion projects. Notice the "efficiency" of invisible market hand. So we actually witness cartel behavior. DRAM contract prices are forecast to rise about 10% on average sequentially in the fourth quarter of 2017. "Most PC-OEMs have concluded negotiating their contract prices with DRAM suppliers for this fourth quarter," said Avril Wu, research director of DRAMeXchange. "Contracts with first-tier DRAM suppliers show that the prices of PC DRAM modules have now risen above US$30 and maintained around US$30.5 on average, amounting to a 7% hike from the third quarter. This price increase is mainly attributed to the influence of the booming mobile DRAM market, which is in turn fueled by the limited product supply and the releases of flagship smartphones during the traditional busy season of this year's second half." "Depending on the capacity specifications, prices of mobile DRAM products could go up by 10% to 20% in the fourth quarter compared with the third. 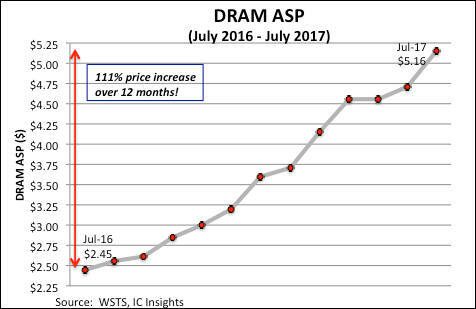 As for the server DRAM market, strong demand during the fourth quarter also will push up contract prices of memory modules by 6% to 10% from the previous three-month period." Server DRAM contract prices for the fourth quarter of 2017 are forecast to rise 6-10% sequentially as demand continues to outpace supply (DRAMeXchange). Micron has filed a lawsuit with a federal court in the North California District accusing UMC and JHICC of copying its DRAM trade secrets, marking the first time for Micron to extend its legal battle across the Taiwan Straits in safeguarding its DRAM IPs. In the past, such legal cases would usually target Taiwan semiconductor players. Taiwan-based DRAM solutions provider Nanya Technology has also filed a lawsuit against two of its former employees, charging them with stealing the firm's technology information before joining a China DRAM maker. All this guys with their patents must be prosecuted and penalized such that no one else will try to impose them again. DRAM prices are expected to soar further in the first half of 2018, and overall market situations will remain steady throughout the year despite some makers having announced plans to ramp up their production capacities, according to Lee Pei-ing, president of Nanya Technology. He said although Samsung Electronics and SK Hynix will expand their DRAM production capacities in 2018, the market will stay relatively stable as a robust 20-25% growth in demand is well expected. 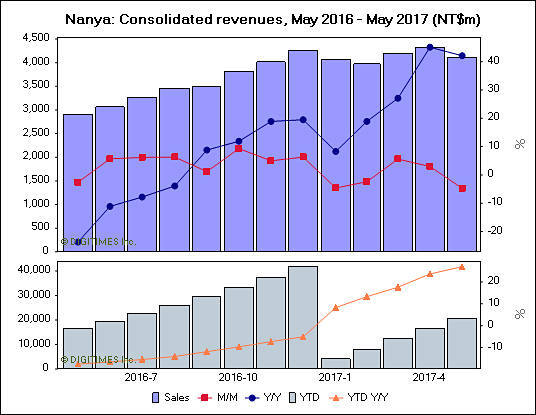 Nanya also reported annual revenues of NT$54.933 billion for 2017, surging 31.9% on year. With average DRAM prices soaring 35% on year, the firm raked in gross profits of NT$24.677 billion, translating into a gross margin of 44.9% in 2017. The company recorded capital expense (capex) of NT$29.395 billion for 2017, and the figure for 2018 is estimated at NT$11.5 billion. Watch the growing number of parasites who do not want to invest in production, but are happy to have multi-million bonuses for nothing. Coupled with the climbing prices of mobile DRAM over the past year and a profit squeeze, major brands have adjusted their production plans and deferred restocking of materials since mid 4Q17. Some key components including mobile DRAM have excess inventory. In 1Q18, the traditional off-season, smartphone vendors are expected to decrease the demand, resulting in a mere 3% rise of the contract prices. 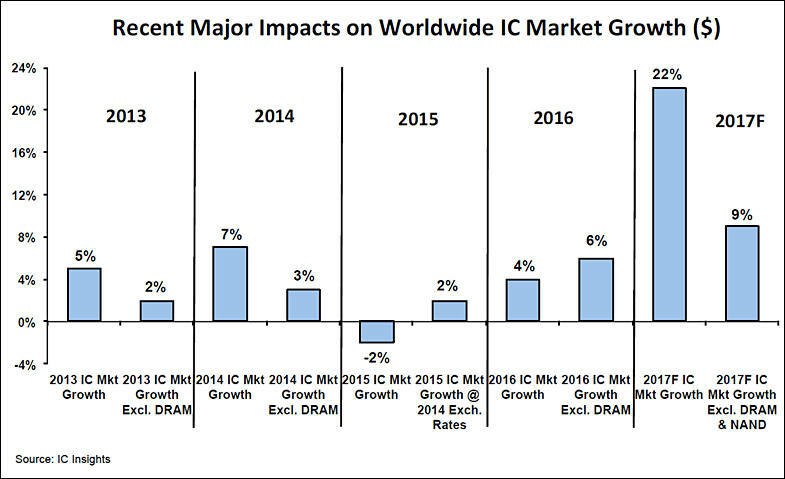 Output value for the global DRAM memory industry will increase more than 30% to US$96 billion in 2018, following a robust 76% surge. Mobile DRAM prices will increase around 3% on quarter, though smartphone sales have started to slow down. 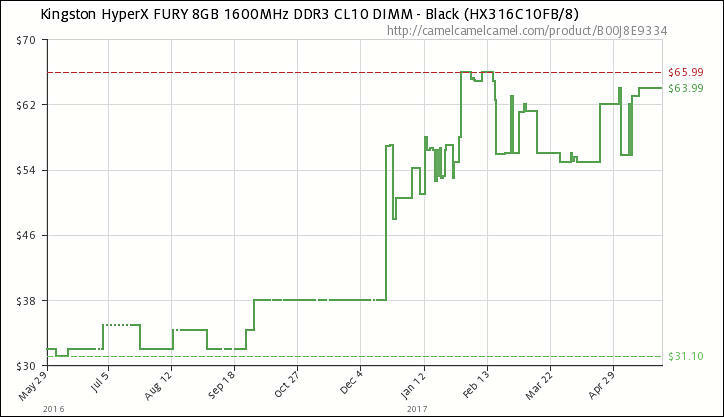 Meanwhile, PC DRAM prices are expected to rise about 5% sequentially while prices of server-use memory will see a 3-5% rally. Samsung saw its DRAM revenues grow 14.5% sequentially to US$10.1 billion in the fourth quarter of 2017, while second-ranked SK Hynix' DRAM revenues climbed 14.1% on quarter to US$6.3 billion. Samsung and SK Hynix took a combined 74.7% share of the global DRAM market in the fourth quarter. Bolstered by robust demand from datacenter and smartphone sectors, the global production value of the DRAM industry is estimated to surge over 30% to US$96 billion in 2018, and price quotes are expected to rise by 5-10% in the first half of the year, according to industry sources. Server DRAM chipmakers have raised their quotes by only 4% sequentially in the first quarter of 2018 as they intend to maintain sales growth with the prices favorable to their clients, said DRAMeXchange. Meanwhile, the top-3 server DRAM providers have moved to aggressively promote their 32GB RDIMM modules.